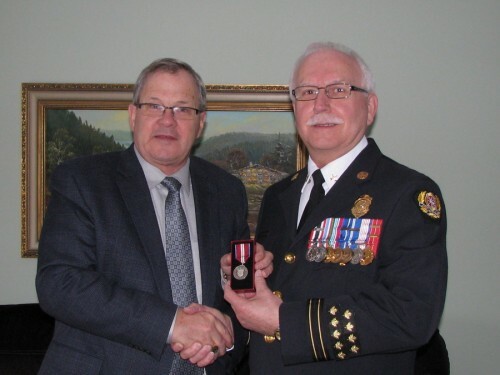 Captain Landry is shown here receiving the Queens Diamond Jubilee Medal from Member of Parliament, Lawrence MacAulay. He received the medal for his work over the past fourteen years as a volunteer webmaster for the Canadian Military Firefighters. He was nominated by the Canadian Forces’ Fire Marshal in Ottawa. Captain Landry is one of the Learning Managers of the Basic Firefighting Program at the APA.